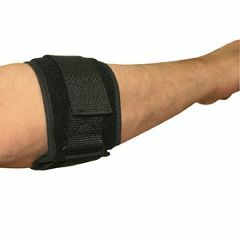 AllegroMedical.com presents NYOrtho Tennis Elbow Support. The NYOrtho Tennis Elbow Support is specially designed to bring relief from the inflammation of the tendons of the elbow caused due to overuse of the muscles of the forearm. Repetitive use of the forearm and wrist can strain the muscles and lead to pain, stiffness or weakness. This Tennis Elbow Support helps in relaxing the forearm and its Velfoam padding wicks away the moisture making it comfortable for the users to wear it for longer period of time.